The following are descriptions and photos of some of the hazards associated with abandoned mine lands. For a complete description of Priority 1 and 2 problem types, visit www.osmre.gov/aml/inven/zp12typ3.htm. For a description of Priority 3 problem types, visit www.osmre.gov/aml/inven/zp3typ3.htm. Water that is discharged from mining or mine-related operations which contains high levels of dissolved iron and aluminum sulfates in conjunction with pH values less than 4.5 (acidic). It is produced when oxygen dissolved in water reacts with pyritic (iron sulfide) materials found in association with most coal deposits. Acid mine drainage (AMD) degrades the water quality of streams and water supplies, often to the point of eliminating all biological activity within the stream contaminated with AMD. The filling of a stream bed with AML-originated silt and debris sedimentation carried downstream by surface runoff. The sedimentation causes a blockage of the stream resulting in the flooding of roads and/or residences and posing a danger to improved property and the public. Any AML-related surface mining spoil pile and bank, mine waste, or earth material disturbed by mining activity that would be eroded and carried downstream by surface runoff and deposited in a stream bed (thus causing a clogged stream).This silt erosion contributes to stream sedimentation and causes local flooding resulting in property damage and a human health, safety, and general welfare threat. The vertical face remaining from the final cut of a surface mining operation. The associated pit may be either water-filled or dry. Any AML-related large-volume water impoundment such as a mine waste embankment, sedimentation pond, or underground mine water pool which poses a threat of flooding and catastrophic destruction to downstream property and human health, safety, and general welfare in the event of rupture or breach of the water retention structure. An AML-related mine waste pile or bank located within close distance to a populated area, public road, or other area of intense visitation, and posing a danger to public health, safety and, general welfare by adverse effect resulting from an unstable steep slope or wind-blown particulate matter. Any AML-related land mass slide of surface-subsurface soil, mine waste pile or bank, or surface mine spoil due to instability of its own weight or lubricating effects of mine drainage water, that endangers human health, safety, and general welfare and destruction of improved property located uphill or downhill from the land mass. The refuse or waste removed from an underground mine. This includes mine waste, rock, pyrites, slate, or other unmarketable materials that are separated during the cleaning process. Gob piles are generally found at coal load-out and processing facilities. Any AML-related dilapidated hazardous equipment or facilities (old engines, mine cars, rails, mine entrance, load-out and processing facilities) located within close proximity to populated areas, along public roads, or other areas of intense visitation. AML-related venting of hazardous or explosive gases. 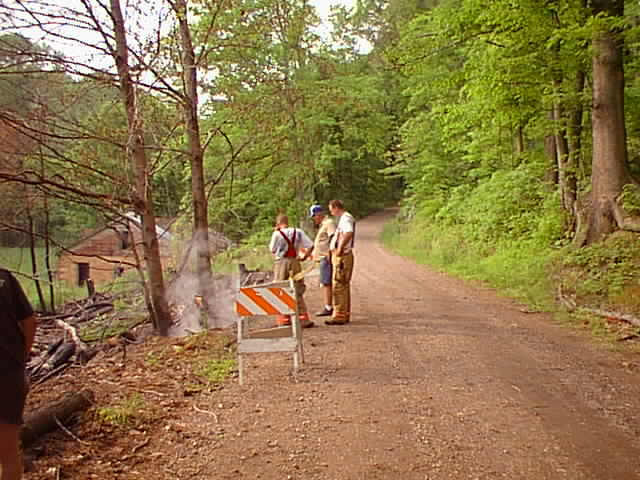 Normally associated with underground mine fires. Any strip pit with impounded water, regardless of depth or surface area, that is considered an attractive nuisance and is located within close proximity to a populated area, public road, or other areas of intense visitation. The hazard must result from some AML-related feature(s) such as steep or unstable banks and hidden underwater ledges. Hazardous water bodies are generally associated with dangerous highwalls. Unauthorized use of AML-impacted areas for residential or industrial waste disposal that poses a danger from unsanitary conditions or from the toxic emissions of burning refuse. A surface entrance to a drift, tunnel, adit, or entry that is not sealed or barricaded. It poses a threat when it is located in close proximity to a populated area, public road, or other area of intense visitation. Any surface expression such as caving, potholes, troughs, tension cracks, or shearing faults caused by AML underground mine voids that damages property and poses a danger to the public. Any AML-related continuous combustion of mine waste material resulting in smoke, haze, heat, or venting of hazardous gases located within close distance to a populated area, public road, or other public use area and posing a danger to the public. Any AML-related continuous smoke, haze, heat, or venting of hazardous gases from underground mine coal combustion posing a danger to the public. A vertical or steeply-inclined shaft or opening that is not sealed or barricaded, or a subsidence-caused opening that has become a hazard, regardless of proximity to populated areas, a public road, or another area of intense visitation, posing a threat to the public.